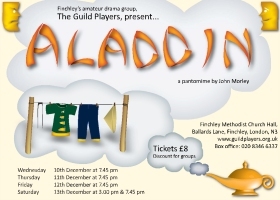 The Guild Players, Finchley�s amateur drama group, present John Morley's version of an all time family favourite. There are plenty of chances to boo and hiss at Abanazer and to cheer Aladdin, Widow Twankey and Wishee Washee. This production contains all the elements of a traditional Christmas pantomime. The Archer, East Finchley's community newspaper, printed a review on page 11 of the January 2009 issue. "Pantomime is back for another season. Well, what can we say? Amazing costumes, oodles of energy. Doddery it was not! The Guild Players presented Aladdin as their Christmas show, and we all loved it. This was a show in strictly panto tradition, with all the usual over-the-top characters, evoking ecstatic grins on the faces of some small boys in my row, and the classic question overheard in the interval, "But why is he a girl?" I went to the matinee, when many children were present, and the audience participation was whole-hearted. The show kept a good balance between pleasing both adults and children, and the entire cast should be congratulated on the way they drew the audience in. This is sometimes difficult to do when the audience is very close, and when a lot of them know the performers, but the actors were excellent. So was the three-piece band, though it seemed a shame that the actor with the most impressive voice (the villain, Abanazer) didn't have more to sing. Full marks, though, for avoiding the love duets, which usually seem so tiresome to a child. The show built to a lively climax. In the words of their last song, they finished on top, and those costumes were fabulous. The Guild Players rehearse and perform at Ballards Lane Methodist Church, N3. For more details about this established company, who put on several shows a year, visit www.guildplayers.org.uk"
Will You Take This Woman?